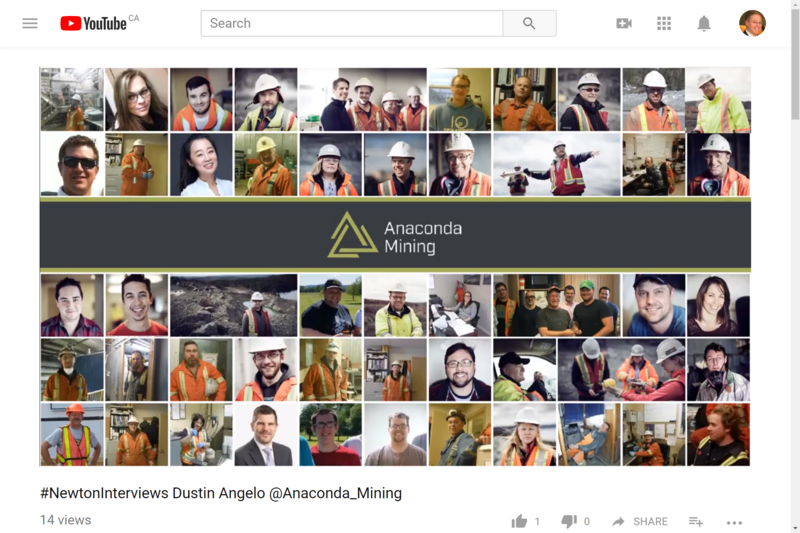 Peter Bell: Hello, this is Peter Bell and I'm here with Dustin Angelo from Anaconda Mining. Hello Dustin! Dustin Angelo: Hey Peter, how are you? Peter Bell: Very good thanks nice to be talking with you on July 5, 2018. It seems like lots of people are suffering out there in junior mining stocks and it’s too bad as there's clearly a bull market going on for the best of the best stocks like Kirkland Lake and Royal Gold. Even Einhorn is suffering redemptions! Not looking to you, Dustin, to buoy our spirits but I have to ask about increasing the offer for Maritime to +100% premium as in news this week – that left me wondering if us, Anaconda shareholders, get to vote on any parts of this transaction! Dustin Angelo: The reason for the increased bid is that we have a concern with this private placement that Maritime is trying to do. We feel it's a defensive tactic. We believe that we can offer a compelling alternative to that. By the way we've structured our latest press release and discussion about this to the market is that we're asking these investors to not participate in this private placement because it's a defensive tactic. At the same time, we feel it's a better offering for the entire shareholder base versus these few investors who are getting some cheap stock. We can offer a premium to the entire Maritime shareholder base. We thought it was compelling to increase our bid in order to make that more forceful. We also believe that there's a very good combination here of the two companies putting together a substantial operating base on the Baie Vert Peninsula, where we have existing infrastructure, production, and a team with experience. We have a 15-plus years of talent capacity. Maritime has the Hammerdown project that can supplement what we're already doing. Then, both companies also have exploration properties along the major fault system along the Baie Vert Peninsula, so you have very compelling potential project where we could be producing 50-60 thousand ounces a year out of this area with long-term potential from the exploration assets. It is important to consistently generate cash flow for a long period of time and we already generate significant amount of cash flow at material with gram and a half gold; imagine if we put material through that mill with seven or eight grams per tonne from Hammerdown! Everybody stands to benefit from that. We're trying to put forward our best offer and give the shareholders of Maritime the opportunity to participate in in this combination, which I think will do a lot of a lot more good than Maritime going on it's own. Especially when you look at the fact that the money they are raising now is already spent! The Maritime circular indicates that their financing is going to last four months. They will be back at the table again for more money after that. It's hard to make any headway in four months. Especially when half of that money is not going into the ground. Presumably, you're not going to see a lift in the stock and they're probably going to have to do the next round at a low price again. When you take into account that you're gonna have to another financing within four months and then juxtapose that with a premium offer by a company with a plan, it is clear. I think we wanted to try and put the final nail in the coffin. Dustin Angelo: We have accelerated the timeline because there is potential for an imminent financing from Maritime. I feel very strongly that a substantial amount of the folks that are participating in that financing are doing it because they ultimately plan on tendering, but we're not interested in having to pay a premium for that cash. Particularly since that cash is certainly not going to be in the in the Treasury when we close because they have to pay all these outstanding bills. You could argue that “well, we would have that liability still”, but the fact of the matter is that we generated a significant amount of cash flow and could have paid the bills without dilution. If those investors want to pull the trigger and buy this new Maritime paper, then they run the risk of having to stick with that Maritime paper and not being able to convert into Anaconda. That is the situation here and now. Like you said, we've drawn a line in the sand and we have to follow through on what we're saying. Peter Bell: I was also glad to see you embracing the publicity machine with the web conference recently. I listened in on that and it went smoothly. It was great to see you as CEO with the COO and CFO. It was a very impressive trio. Dustin Angelo: That was purposeful. One of the key attributes that we feel about our company, as it relates to this transaction, is that we have a very strong team. The public may hear from me because I'm the one doing the interviews and whatnot, but you know it's truly a team effort. There's a strong team here with me and I wanted to show the Maritime shareholders that fact. I can't put everybody on camera as there are not enough seats, but I think the public got a sense for our CFO and COO who are very strong individuals, very capable, and very experienced managers for their part of the business. That's what we bring to the table. We have many more people like that at various positions and we’ve shown the Maritime shareholders a little bit of what they could be getting, as opposed to the management that they've got currently. Peter Bell: And there was another video published recently with a 25-year-old geologist whose name escapes me, sorry, talking about exploration. Again, that was another piece that I thought was very compelling – particularly if Maritime has a shareholder base in that local community they might be able to recognize that person who is speaking as somebody who's from Newfoundland and from that area. I don't know the details of that, but I suspect that that might have really struck a chord with the local presence you have there. Dustin Angelo: We've got a very young workforce with a lot of folks in their 20s and 30s who are in management decision-making positions. We've got a culture that is essentially a meritocracy, where those that can do are given leadership opportunities. We look to those people to be the leaders. It's not just about seniority. There are a lot of smart people who are younger. The difference between the younger and the older ones is the experience. The only way for them to get the experience frankly is to take on roles and responsibilities that typically aren't given to them in larger companies. They have the opportunity with us and we let them flourish. Peter Bell: Absolutely. I know my chance to talk with Alan Cramm and Jonathan Fitzgerald last year gave me some good insight into all that stuff. Very inspiring to hear from that senior level within the company. I always wonder about coming out of a tough time for mining markets – if new producers or growing producers or producers who made it through the tough times become a key growth area for market valuation. Dustin Angelo: I would certainly say that you certainly become stronger as a team if you make it through those lean times. We've certainly been through those and have cut our teeth in Newfoundland. We have grown to Nova Scotia now and are taking all our experience with us. As we grow bigger and get more interests in different ways, whether through new deals or with new people who want to work with us, it can start to feed on itself. We're starting to get more momentum and if we're successful here at Maritime then I think that's gonna add to the momentum. We'll continue to improve and I think that, ultimately, will accrue to the shareholders. Peter Bell: It's still the most-awarded-mining-company that I've ever followed closely. Keep up the good work! And I'd ask about Anaconda Mining with Hammerdown versus without. Do we have a sense for what that looks like in terms of potential production profile for the next five years or longer-term? I wonder how critical this acquisition really is right for Anaconda. Dustin Angelo: Let's start by remembering one thing: there was a life before Hammerdown. Our company was on a good growth track. We have a lot of organic opportunities at Point Rousse and Goldboro. After we acquired Goldboro, we laid out a vision that we would be in the fifty to sixty thousand ounces per year range once Goldboro came on. As we extended production at Point Rousse, that plan is still there. We're still working on it. We don't have a deal yet with Maritime and even when we first launched the bid, we were continuing down the path as if we didn't have Maritime because you never know what's going to happen. We have the growth opportunities and there are other acquisition opportunities within Atlantic Canada. We continue to look at those. If we're not successful with Maritime, then we'll move to the next one and find other areas to grow. There are certainly opportunities in in Newfoundland and Nova Scotia, which are the two areas that we like to focus on right now. We still have a goal of getting about hundred thousand ounces a year as the next major milestone or interim step on the larger goal of getting to a hundred thousand ounces or more and in the next five years. Peter Bell: And I feel like you can say that with or without Hammerdown. Dustin Angelo: Yes, I think so. Like I said, there are others opportunities like Hammerdown our there. This is not the only opportunity out there. It is an opportunity that we like, but we're disciplined about our acquisition targets. If we can do it under the right terms, then we will. If we can't, then we will move on to the next thing. Peter Bell: I guess that's one of the questions for me as an Anaconda shareholder. Seeing you up this offer for Maritime and looking at them potentially coming in as a large shareholder group for Anaconda if the deal goes through – I wonder about having them as owners of the company. Will they be good shareholders for Anaconda or not? I am apprehensive about that and hope you aren't chasing something that's getting away from you. Dustin Angelo: Based on our last offer, they will own about 27% of the company. Those shares would be widely distributed throughout a large shareholder base. Overall, I think a lot of people see the merits of the combination in what we can build on Baie Verte Peninsula. We're offering an all-stock deal, although you typically see all-cash for takeovers, and we're doing that because cash is sacred in the junior mining business and we want to afford the opportunity for the Maritime shareholders to participate in what we see as tremendous upside and the potential re-rating of the company as a combined entity as we put these assets together. People lose sight of it, not purposefully, that we still have Goldboro. When you put together what we can do on the Baie Verte Peninsula plus Goldboro in Nova Scotia, that's a pretty substantial asset base from which we can we can generate a significant amount of production. That would be the goal – to get about a hundred thousand ounces a year. If Maritime shareholders have stuck around this long under current management, then I would imagine that they would they want to see under the hood here as to what we can do. Peter Bell: Yes and it's concerning to read in your latest news release that Maritime management didn’t look into the data room or something to that effect. Is there any detail or clarity you can provide around that comment? Dustin Angelo: We were responding to the fact that in one of their prior press releases, they mentioned that we had open up a data room to them but essentially said that we provided mostly publicly available information. That was completely and utterly false. We opened up a data room to them and provided them with a lot of information that you wouldn't find in the public domain. We gave them the underlying block model, the drill hole databases, our 2018 budgets, our 10-year financial model with all of our properties including Hammerdown. We provided them a lot of information about permitting pit designs, tailings facility designs, and all of our exploration geophysics, geochemical work. Everything we could to help them get their head around the potential for mineral resource expansion around Goldboro, Point Rousse, and even some of our satellite exploitation sites. This is all stuff that's not in the public domain. It was perplexing that that they would say that it was mostly public information when it wasn't. We wanted to respond that and make sure people understood that we opened up a data room to them because we were trying to reach out and find a way to engage them. They had said early on that they didn't have the ability to assess our offer because they didn't have enough information to evaluate our company, so we set out to answer that for them by giving them all this information. They responded once and asked for some follow-up information, some of which was already there in the data room. Other than that, they haven't engaged us about it. Typically, you'd have a kickoff call for these situations. It helps you to be more efficient when you look through the data room and show what's in there. They didn't want to have that call. We followed up multiple times. Typically, when you're looking through a data room you're going to have questions – questions about the data, not just whether something is in there or not. They never came back with any questions, which I find perplexing. If they truly were doing a deep dive into our company, then they would have come up with questions. That just leads us to believe that they didn't really look through the data room. They may have said that they did, but there just wasn't the back and forth you would expect for such a situation. Peter Bell: I can appreciate how difficult it might to dig through that data room based on everything I've learned about Anaconda over the last two years. There are a lot a lot of different aspects of the company. Trying to understand all of it and determine whether or not it's appropriate to support the proposed transaction from Maritime’s perspective must be a huge undertaking. If you really want to get into it, then it’s everything from the narrow vein technology stuff through to your safety procedures at site. I'm sure all that is very well documented at Point Rousse and I can imagine it's overwhelming to see all that stuff. Dustin Angelo: And that's why you would think that there would be some back-forth to help them through the info and make their work more efficient. Peter Bell: Good to see you raising some flow through funding recently. I was very pleased to see that as a signal of you committing to do some serious exploration work here. I don't recall if that was earmarked for Goldboro versus stuff in Newfoundland. I would also ask about the bulk sample – is that flow through eligible? Dustin Angelo: No, the bulk sample isn't flow through eligible. We've already basically found the financing for it, as most of it can be generated internally. There may be ways to pre-sell that production, too. Between that and internally generated cash, we expect to be able to finance the bulk sample. It is taking a bit longer because the permitting process is taking longer. We've been held up a few times and are working through it. We have our fingers crossed that we'll have it within a month or two. Peter Bell: It seems that Nova Scotia has some challenges with permitting. There were some wrinkles at the end of the development stage for Atlantic Gold there around what needed to be permitted when. Hopefully Nova Scotia can figure out that mining is important and that there's good potential for it in the province there. Dustin Angelo: Yes, I think they are supportive. There's more activity now and it may be getting complicated with the number of bodies involved, but I think they want the mining activity. Especially in the rural parts of Nova Scotia. There might be some teething pain as we get through these issues, but we're open to working with the government and help make it a process that is transparent. Peter Bell: And to ask about one of these images in one of the in your slide deck, slide eight from the June version. “Consolidation in Atlantic Canada”. There are so many little yellow dots all around the area approximately 16 projects greater than 11 million announced ounces of gold Newfoundland Nova Scotia New Brunswick. It's very exciting to read about you guys positioning yourself as “the consolidator” in the region. That sets up some pretty important discussions down the line, depending on how you're able to execute on that strategy. I wonder about this and Maritime. The Orex deal went smoothly with Goldboro. If the maritime deal doesn't go through, then I don't see it really sinking your chances to continue to be the consolidator in the region. I wonder any what you have to say about that vision for the company. Dustin Angelo: Well, we touched on it before – there are a lot of projects in Atlantic Canada and I think that the opportunities are still there for us. Again, we'd like to do the Maritime deal but if it doesn't work out then there are other deals we can do. There are certainly things that we can focus on and the opportunity is still there with an Atlantic Canada. These projects are off the radar for a lot of folks. For the most part, they may struggle as standalone operations. Putting them underneath infrastructure with a management team who can use that infrastructure in whole or part can help those projects get off the ground. In the absence of some significant exploration at some of these properties and building them out from a resource perspective, a lot of these projects are on the smaller side. I think that a lot of these projects have the ability to get much larger. That is part of our thesis, that we buy them now, grow them, and put them into production. Goldboro was a great example of that. We've drilled over almost 12,000 meters there since October. The mineralization is open in all directions – down plunge, down dip, and then along strike. It's been a very good drill campaign. We're excited. As I mentioned before, the lion's share of the flow through money will go Goldboro. There's just a lot more to do there. It's got the potential to be a much bigger deposit and we keep finding new things about it. Peter Bell has not been compensated to prepare and distribute this material.